A rat is a deceptively intelligent and sensitive creature. Grinding its teeth is indeed a behavioral adaptation but also an indication of how it is feeling. Also known as bruxing, grinding can either be a sign of anxiety or happiness. Rats spend their lives perpetually nibbling and chewing on whatever they can find. Perhaps this is the key to their survival – they have learned to use almost anything remotely edible as sustenance. But with this constant nibbling their teeth wear down quickly. To combat the erosion their teeth are open rooted, meaning they are constantly growing not unlike nails or claws. Similar to nails or claws the rat incisors must be kept filed down or else they will cut into the lower jaw. What Happens If the Incisors Are Too Long? A wild rat will usually manage on its own to keep its incisors at an acceptable length. However, its domesticated counterpart will often need help from it human caretaker. Not only can too-long incisors cause injuries to the lower jaw but they can also cause malocclusion (misalignment of the mandibles). With malocclusion comes other aggravations that can certainly cause sickness or discomfort. Along with malocclusion overgrown teeth will cause the root to grow also. When the root grows too long inflammation and infections are bound to happen. There is a variety of pet products aimed at keeping your rat’s teeth at their best. Chew blocks, treats, and toys all function as nibbling devices, filing down the teeth to a manageable size. Additionally, these toys keep your rat engaged and active. Furthermore, observing your rat’s eating habits is a great way to ensure its teeth are healthy. A trip to the dentist never hurts – even though your rat is a tiny creature it still feels pain acutely. Having bad teeth and a sore mouth is no fun for any creature! Unfortunately, there is no direct way to tell if your rat is bruxing because it is happy or sad. Circumstances and context are big in determining how your rat is feeling. If you’re at the vet’s office and you notice your rat bruxing, it is most likely due to stress. Bruxing during any unfamiliar situations would normally be an indication of anxiety. Rats will also make sounds of clear distress such as squeaking and squealing. Cats and larger animals lurking around his cage will cause undue stress as will loud noises. Rats have very sensitive hearing. 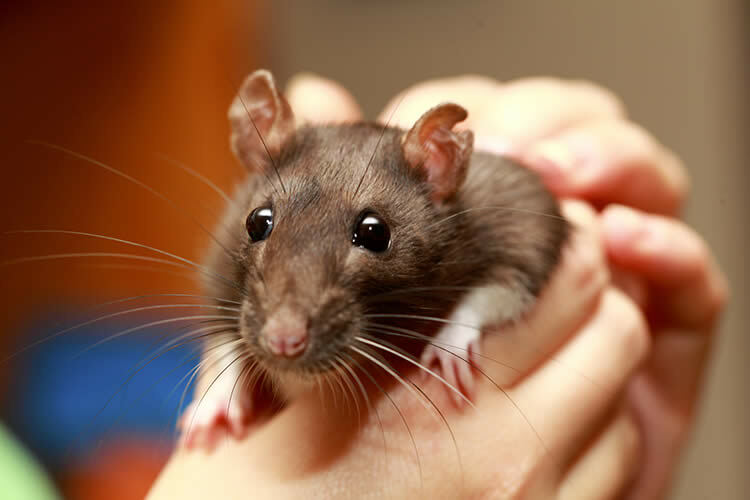 Constant loud noises can cause rats anxiety. Even normal noises to us – such as washing dishes – will sound very loud to a rat. Noises especially high-pitched ones distress rats terribly. On the other hand, if your rat is playing and running around his cage, it is likely bruxing because it is feeling happy and calm. Its behavior surrounding the bruxing is how you determine its mood. When a rat is scared or stressed it will usually retreat to a tight corner or try to hide itself away. A happy rat is energetic and wants to be out in the open. What Bones Are Safe for Dogs?